…and yours truly is on it! Firstly, as always a very warm thank you to all the people who came out to see me play in February, including those at my old work place, Sheffield Students’ Union bar, The Windmill in Brixton, and at Camden’s Heroes bar this week. 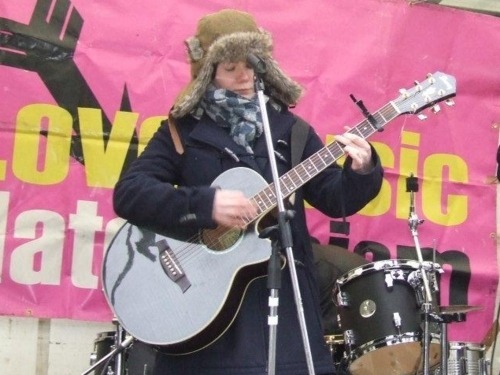 I was also honoured to be asked once again to play at another anti-fascism demonstration in lovely Leicester (above), where hundreds of people came out to show their support for an inclusive society free of racism, and to show the EDL that their poisonous rhetoric isn’t welcome in our city. No pasaran! Speaking of my much loved hometown, I am thrilled to announce that I will be returning this year to the brilliant Leicester festival Summer Sundae Weekender on August 19th. For more information about the awesome line-up go to http://summersundae.com/ and I look forward to seeing you there! Last month I also recorded a live version of Farewell to Welfare and babbled on incoherently about the Tories to John Harris and Simon Jenkins for a Radio 4 documentary piece. The show will be aired at the beginning of April, so stay tuned to find out exactly when. I have confirmed appearances on the main stage at Tolpuddle Martyrs’ Festival for the Sunday afternoon, and for the Women Chainmakers Festival in Sandwell in June. For more information check out the gigs page here. My interview with online magazine iCrates can be found here - many thanks to Ollie Levy for taking the time to talk to me. And I’d like to say a huge thank you to Unison for the fantastic reception they gave me at their Get Active! event at the end of January. It gave me a real boost to meet some of the people working at the union and see how passionately they feel about their work, which is more important than ever at this time. I’m in the process of planning what’s shaping up to be a very busy summer so please do get in touch with your festival/live work requests. And yes, I did say I would have more copies of Mark My Words on sale by February - sure enough my pants are on fire. They will be arriving in the next 2 weeks and will be available to you good people as soon as I have my little paws on them!